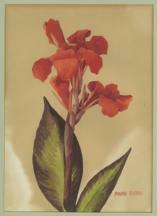 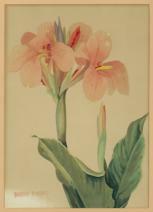 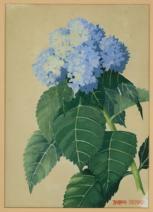 A "Virtual World" Exhibition of the World's Foremost 20th Century Watercolour Botanical Artist. 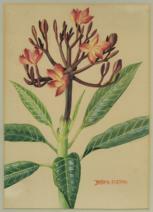 These watercolour paintings were painted in Malaya in the 1950's to decorate the bare walls of rubber eatate bungalows. 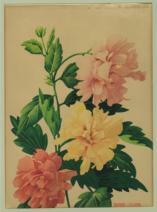 They were painted on coloured paper as white cartridge paper was unobtainable then. 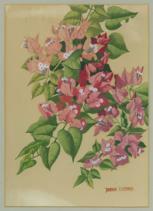 Their style is derivative of the early work that Barbara Everard carried out restoring Chinese wallpapers while employed in Thornton-Smith's furniture workshop in London's Soho area during the 1930's. 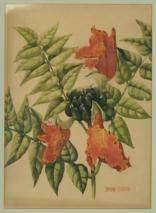 Note, also, that Barbara's eye for accuracy painted what she saw, thus a bougainvillaea leaf chewed by a caterpillar!